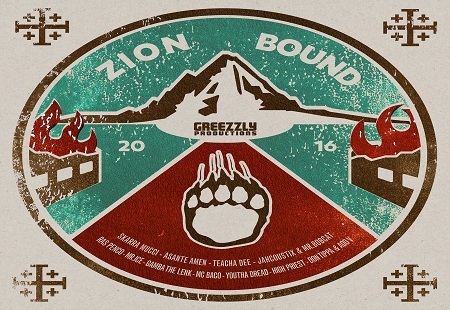 Six months after the release of Roots & Kulcha riddim gaining big appreciation from all over the world,Greezzly is back on the track with a brand new deep roots riddim release by the name of Zion Bound, featuring a highly inspired artist line up from Jamaica, Africa, Usa, and Europe. The album opens with Asante Amen's awesome tune whose lyrics are responsible for the album title. Greezzly's long time collaborator Teacha Dee keep the strong and spiritual vibe with the apocalyptic "Lightning, Earthquake And Thunder" as do Ras Penco with his hypnotic heartfelt chant. Europe based reggae superstar Skarra Mucci grace the riddim with his gospel followed by another artist enjoying big fame among the european massive: the great Jahcoustix in combination with italian veteran Mr.Bobcat. Selection goes on with some name well known to those who followed the label's releases in the last 5 years, we are talking about Ten Floor artist like Mr.Ice, Don Tippa and Add V, italy based High Priest whose powerful song was the title track of his well received debut album, gambian talent Youtha Dread(previously known as Jah Youth) and italians standard-bearers Mc Baco and Gamba The Lenk. Sei mesi dopo il rilascio di Roots & Kulcha riddim che guadagna grande apprezzamento in tutto il mondo, GREEZZLY torna in pista con un nuovo riddim "Zion Bound",con artisti dalla Giamaica, Africa, Stati Uniti, Europa. L'album si apre con la melodica voce di Asante Amen. Collaboratore di lunga data di Greezzly Teacha Dee, Ras Penco con la sua ipnotica cantilena sentita.Skarra Mucci seguito da un altro artista il grande Jahcoustix in combination con il veterano Mr.Bobcat. La selezione prosegue con Mr.Ice, Don Tippa, Add V, High Priest il talento Gambiano Youtha Dread (precedentemente conosciuto come Jah Youth) e gli italiani Mc Baco e Gamba The Lenk.